The City of Elkhorn is located just west of the Omaha metropolitan area. The City is rapidly growing as suburban development spreads westward from Omaha into the Elkhorn area. In November of 2002, City residents approved a $4.5 million bond issue to build a community recreation center. At the same time, School District residents voted a $2.9 million bond issue to construct a competition pool with deck, seating, and locker rooms within a community recreation center. 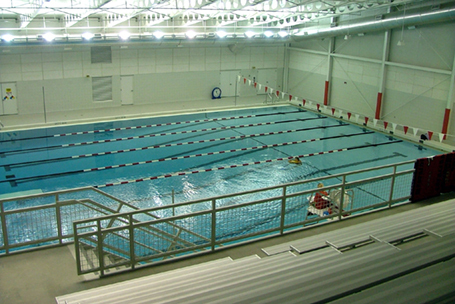 The Elkhorn Community Recreation Center was constructed on approximately five acres of land located on the northwest corner of the Elkhorn High School. The new indoor aquatic center, designed by Counsilman-Hunsaker features an eight-lane, 25-yard competition pool with bleacher seating for 400 spectators.